San Diego State quarterback Kevin O'Connell has thrown for 2,242 yards and 16 touchdowns this season. When Hawaii hosted San Diego State in 2002, a total of 1,242 yards were generated at Aloha Stadium. The Warriors were outgained yardage-wise, but ended up with one point more than the Aztecs, 41-40. Not many key players from that game are left from either team. But the guy who scored the final touchdown to set up UH's win is still around -- UH running back Nate Ilaoa. Then a freshman, he accounted for 131 yards receiving and rushing against SDSU. It was the last full game he played before this season after injuring his knee in the 2003 opener. Hawaii coach June Jones said this could be another scoring fest. "It could be very similar (to 2002)," Jones said. "Same two coaches, same two schemes." When Hawaii has the ball: Ball-hawking free safety Marcus Demps has four interceptions, including one for a TD in the Aztecs' last game, a win over Wyoming. Strong safety Brett Sturm has three more picks, and SDSU has 17 as a team. UH slotback Ryan Grice-Mullen said the Aztecs are unorthodox. "The way they play pass coverage is different than any other team we've seen. They play kind of a crazy look," he said. "Sometimes they go back and they've got five guys 20 yards deep. You don't know if they're going to come up and play man or zone. It looks like they've got a lot of team speed, but I think I can get by them a little bit. "We really have to focus on reading the coverages. They disguise it really well." Quarterback Colt Brennan said the Aztecs' defense might be harder to attack than Wisconsin's was last week. "They're very athletic, with some quicker guys. Not the biggest guys, but quick. They can guard our receivers better," said Brennan, who piled up 403 passing yards against the Badgers but was sacked five times. UH's leading receiver, Davone Bess, is expected to play after being knocked out of last week's game with a hip pointer after scoring twice. Freshmen Bess and Grice-Mullen have each compiled more than 1,000 yards receiving for the season. When San Diego State has the ball: Like Brennan, SDSU quarterback Kevin O'Connell is a threat to run at any time. He's rushed 73 times for 357 yards. "He may be the best running quarterback we've faced, and he's 6-6," UH defensive coordinator Jerry Glanville said. "Most guys 6-6 can't cut and move and avoid getting tackled like he can. He does a good job." Lynell Hamilton isn't quite Marshall Faulk, who carved up UH's rush defense for 687 yards and 13 TDs in three games in the early 1990s. But he's pretty good. 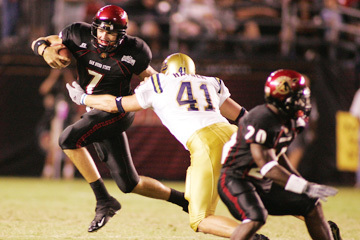 The 2003 freshman All-America choice rushed for 108 and 154 yards in SDSU's last two games, both wins. O'Connell is wary of UH's blitz packages, despite the Warriors' lack of sacks in recent games. "They're very athletic. Coach Glanville has them lined up all over the place trying to confuse offenses. Their schemes are meant to cause confusion. It will be a tough task for us," O'Connell said. Ryan Keomaka is expected to start at corner due to injuries to Turmarian Moreland and Keao Monteilh. Special teams: SDSU sophomore punter Michael Hughes ranks eighth in the nation with a 44.8-yard average. Kicker Garrett Palmer has made 14 of 16 field-goal attempts. UH is last in the WAC in kickoff returns and 94th in the nation in punt returns. Despite all the offensive action when these teams met three years ago, the biggest play was made on defense. UH defensive end Travis LaBoy sacked SDSU quarterback Lon Sheriff on fourth down in the final minutes to secure a 41-40 victory for UH. That's how it happens sometimes when two offensive-minded teams clash -- the one with a defense that makes at least one play when it counts most wins. Kila Kamakawiwo'ole replaced LaBoy as uniform No. 1 two years ago, and he's emerged as the Warriors' top big-play producer in defensive coordinator Jerry Glanville's 3-4 scheme. The outside linebacker leads UH and is among the best in the WAC with 14.5 tackles for loss, eight sacks and three forced fumbles. "This might be the best defensive scheme I could play in," said Kamakawiwo'ole, who played end in the 4-3 before Glanville's arrival. The Warriors did not get a sack or turnover against Wisconsin last week. It is imperative for Kamakawiwo'ole and his teammates to pressure and contain San Diego State QB Kevin O'Connell. SE 19 Jeff Webb 6-2 205 Sr.
LT 78 Chris Pino 6-5 315 Sr.
LG 63 Taylor Schmidt 6-4 315 Sr.
C 72 Jasper Harvey 6-3 300 Sr.
RG 62 Brandyn Dombrowski 6-5 325 So. RT 76 Will Robinson 6-6 270 So. TE 87 Eric Miclot 6-5 235 So. FL 1 Chazeray Schilens 6-4 205 So. QB 7 Kevin O'Connell 6-6 220 So. RB 22 Lynell Hamilton 6-1 220 So. SB 80 Robert Ortiz 6-1 195 Sr.
E 97 Kurt Kahui 6-1 250 Sr.
T 94 Nick Osborn 6-4 255 So. T 99 Jonathan Bailes 6-1 297 Jr.
E 93 Antwan Applewhite 6-3 235 So. LB 46 Russell Allen 6-3 225 Fr. LB 33 Freddy Keiaho 6-0 230 Sr.
LB 51 Joe Martin 6-1 225 Jr.
CB 3 Donny Baker 5-9 165 Jr.
FS 21 Marcus Demps 6-1 200 Sr.
SS 31 Reggie Grigsby 5-11 205 Jr.
CB 9 Terrell Maze 5-11 170 Jr.
PK 17 Michael Hughes 5-10 185 So. P 14 Garrett Palmer 6-2 180 So. SN 52 Tyler Schmidt 6-2 220 So. KR 20 Michael Franklin 5-7 180 Sr.
PR 20 Michael Franklin 5-7 180 Sr.
H 11 Matt Dlugolecki 6-4 205 Sr.
X 88 Chad Mock 5-11 171 Jr.
RB 4 Nate Ilaoa 5-9 248 Sr.
END 98 Melila Purcell 6-5 266 Sr.
WILL 1 Kila Kamakawiwo'ole 6-3 237 Sr.
STUB 45 Tanuvasa Moe 6-0 225 Sr.
CB 9 Ryan Keomaka 5-10 168 So. FS 22 Lamar Broadway 6-0 186 Sr.
LS 57 Jake Ingram 6-4 226 Fr.